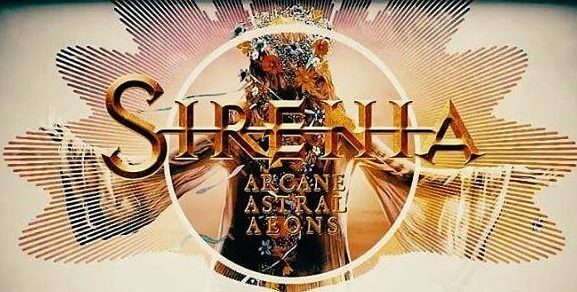 With their ninth, and latest alliteratively-pleasing effort (following 2016’s “Dim Days Of Dolor”), the Norwegian symphonic metal band Sirenia delivers loads of hair-raising Gothic drama – read orchestration, plentiful segments of choral singing, operatic vocals, and layered-upon-layered arrangements. Singer / composer / bassist Morten Veland, singer Emmanuelle Zoldan, and guitarists Jan Erik Soltvedt and Nils Courbaron start things off with “In Styx Embrace.” Zoldan’s voice is a rich, soaring soprano that cuts through all the layers while not unduly standing out. The track is kind of about the finality of death and regretting one’s mistakes (“I gave my all for no greater cause / At the end it dawned on me / There was no need to even carry on”), using the river Styx from Greek mythology as a metaphor. “Into The Night” is an exhilarating and spiraling rush; pairing piano and more orchestration with pummeling riffs, a sing-along chorus, and those modulations we power metal freaks live for (they never get old and still make the hair stand up on your arms). “Love Like Cyanide” is a real treat. Veland and Zoldan sound great together, whether he is growling or singing. A fantastic atonal breakdown midway gives heft to all the prettiness. Sure, it might go on a bit longer than it should, but who doesn’t want another go-through of that chorus and a string section reprise of the melody? “Asphyxia” again uses a metaphor, of literal drowning, to convey a message of despair and hopelessness and depression. “Queen Of Lies” is symphonic metal to the max, melding Veland’s sinister growls and Zoltan’s supple soaring with a percolating groove. It plays exactly by the numbers, but if you like this stuff, it’s a gold mine. “Nos Heures Sombres,” sung entirely in French, is atmospheric and dreamy. Zoldan doesn’t always rely on the operatic flourishes – her singing is pretty straightforward – but when she does, it’s for very effective emphasis. This, like many other tracks, includes drifts of spoken-word dialogue that sounds like it was culled from an art-house film. “The Voyage” is a crushing stomp of a swinging groove à la Pantera. Raw and rugged, it’s the earthiest of the tracks here, despite the violin and acoustic breakdown and the Gregorian chanting. Its trippy, musing lyrics touch on death and hopelessness. “The Twilight Hour” depicts a witches’ coven with Zoldan in full trilling operatic voice. It’s a beautiful, alluring terror, with horror-movie strings and more choral singing to emphasize the mood. “Glowing Embers” is a nicely optimistic way to wrap things up (“You are the light that conquers darkness / You are the dream that transcends / You are the hope that speaks to my heart / My faith until the end,” Zoldan sings). The creepy, minor key segment, though, ensures we don’t get too complacent. If you miss Nightwish with Tarja, Sirenia is a lovely substitute since we’re not getting THAT back anytime soon. They might not be as high-minded or thematically deep as the Finnish legends, but the ideas and the sound are there.